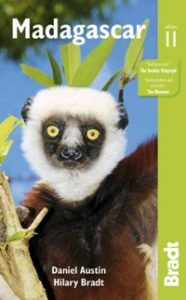 Written for the curious traveler, this handy guide describes and illustrates with color photographs 250 species of mammals, birds, reptiles and invertebrates of Madagascar. With introductory chapters on vegetation zones, ecology and a good map. Fourth edition. This far-ranging book is part travelogue, part natural history essay and an excellent example of science reporting. Not just a book of intellectual adventure, it is a superb, detailed overview of the science of island biogeography. A talented writer and formidable researcher, Quammen is a master at explaining complex evolutionary phenomena with humor, wit and understanding. 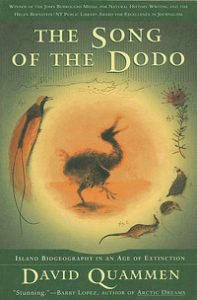 In this book, Quammen takes us from university offices to the rain forests of Brazil, the island of Komodo in Indonesia, among the lemurs in Madagascar and, perhaps most memorably, to the island of Mauritius where the dodo once roamed the forest floor. Eight years in the making, Song of the Dodo is a masterwork: forceful, clearly written and engaging. 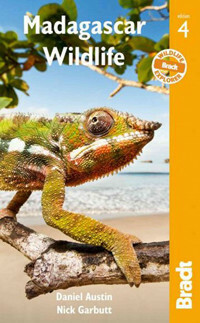 Produced by the BBC, this spectacular three-part series, featuring the familiar voiceover narration of David Attenborough, introduces viewers to a wide range of species that have adapted to Madagascar’s diverse and distinct environments, which include an arid western side, sandy wilderness on the southern end, lush rainforest in the east, and the mountains dividing the island in half. From the stunning Nosy Be archipelago to the enchanting coastal town of Fort Dauphin via the friendly capital Antananarivo, with terrific wildlife information and photography, Bradt’s Madagascar leads the way. Hilary Bradt’s comprehensive guide to Madagascar, its history, people and nature, now in its 11th edition, remains our model for guidebooks: personal, culturally astute, an absolute pleasure to read. With photographs, sketch maps and wise travel information. 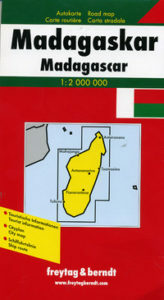 A clear shaded relief map of Madagascar at a scale of 1:1,000,000. Two Sides. 35×21 inches..